Lost in the diplomatic wrangling over the fate of the Rohingya fleeing Myanmar are the harrowing personal consequences. GELUGOR, MALAYSIA — Carrying one child in her arm, a second on her back and holding the hand of a third, Hasinah Izhar waded waist-deep through a mangrove swamp into the Bay of Bengal, toward a fishing boat bobbing in the dusk. If she was going to change her mind, she would have to do it now. 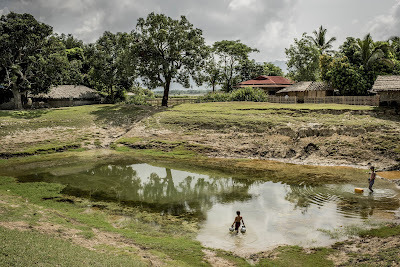 Ms. Izhar, 33, had reached the muddy shore after sneaking down the dirt paths and around the fish ponds of western Myanmar, where she and about one million other members of the Rohingya minority are stateless, shunned and persecuted for their Muslim faith. She had signed up for passage to Malaysia, but knew that the voyage would be treacherous, that even if she survived, the smugglers would demand ransom before letting her and her children go, and that they sometimes beat, tortured or sold into slavery those who could not pay. Her husband, who had raised shrimp and cattle, had been among tens of thousands who made the journey two years earlier, after Buddhist mobs rampaged through villages like their own, burning houses and killing at least 200 people. He had warned her not to follow, telling her that the trip was too dangerous and too expensive. But as she reached the wooden skiff that would take them on the first leg of a weekslong journey, one terrible fact weighed heaviest: She had left behind her oldest child, a 13-year-old boy named Jubair. Since 2012, tens of thousands of Rohingya have fled Myanmar, where they are officially considered intruders. The exodus exploded into a regional crisis in May after smugglers abandoned thousands of them at sea, leaving them adrift with little food or water and no country willing to take them in. Amid a global outcry, Malaysia and Indonesia eventually agreed to accept the migrants, temporarily. But lost in the diplomatic wrangling over the fate of the Rohingya are the anguished choices faced by the families who leave and the harrowing personal consequences they must endure. Ms. Izhar knew it would cost as much as $2,000 just to bring her three youngest children to Malaysia. Taking Jubair could double the smugglers’ price, and she had only $500 from selling their house, a bamboo and mud-daub hut in the village of Thayet Oak. The eighth of 10 children raised by a farming couple, she had spent her entire life in the countryside around the village. She was married there at 18, and lost her first husband to a sudden illness. She relied on help from relatives to support her two gangly boys, Jubair and Junaid. A few years later, she married again and had another boy, Sufaid, and then a girl, Parmin. It was while she was pregnant with Parmin that her husband fled to Malaysia. 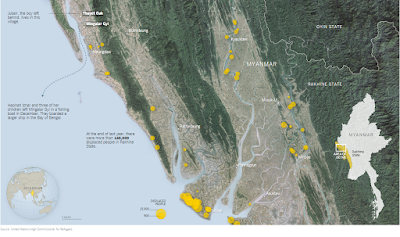 Buddhist militants, incensed by rumors that Muslims had raped a Buddhist woman, had attacked villages like Thayet Oak across Rakhine State, the coastal region home to most of Myanmar’s Rohingya. The police and the army stood by and did nothing. Worried that he would be arrested and beaten like some of his friends, Ms. Izhar’s husband, Dil Muhammad Rahman, went into hiding, making fleeting visits home in the dead of night. Then in late 2012, he disappeared entirely, not calling to tell her that he had gone to Malaysia until three months after he reached there. Violence against the Rohingya flared again last year. Ms. Izhar heard rumors of children being shot. She saw police officers break a man’s hand and strike another in the head with clubs, leaving him bleeding and unconscious. Women living alone were especially vulnerable, and when night fell, she kept the house dark and hushed her children. “I didn’t even light a lamp,” she said. Fear was a constant. By December, when word of ships waiting in the Bay of Bengal spread through the villages, she could not wait any longer. Now, as she heaved her children into the boat in the darkness, her mind was a jumble of relief, fear and regret. Malaysia is a Muslim nation, she knew, and she believed she and her children would be safe there. But she had not told her husband they were coming. She hoped he would still be happy to see them, and that he would find the money to pay the smugglers. Most of all, though, she was tormented by the thought of Jubair. What would become of him, alone in Thayet Oak, exposed to the very dangers she was running from? What would have become of her other children if they had stayed? When it was time to leave, Jubair was off with friends in another village, and there was no time to think. She gathered up the other children, packed a bundle with a few changes of clothes for the children and three plastic bottles of water, and fled. Now, as the shoreline receded in the distance, she wished she had had a chance to explain her decision to Jubair, and to hug him goodbye. After a few hours, the passengers were transferred to a motorboat, which bounced through the dark, choppy sea, making her nauseated, and later transferred again, to a ship somewhere in the Bay of Bengal. Ms. Izhar and her children huddled with a dozen women and their children on the deck. Men and teenage boys were led to the hold. Most of the 250 or so passengers spoke Rohingya, while some sounded as if they were from Bangladesh. In the morning, the crew handed out the first meal that she and her children would have since leaving their village two days earlier: lumps of cold, precooked rice and pieces of palm sugar. Ms. Izhar, seasick, had trouble holding it down. She vomited repeatedly. It was December, and the small Rohingya family had become so much cargo in the growing, multinational people-smuggling businesses. Smugglers took around 58,000 people, mostly from Myanmar and Bangladesh, on the journey last year through the Bay of Bengal and the Andaman Sea, often via southern Thailand and then on to Malaysia, according the International Organization for Migration. They took 25,000 more people in the first three months of this year. Many Rohingya ended up trading one nightmare for another. Some were confined for weeks to fetid, cramped holds reeking of vomit and excrement. 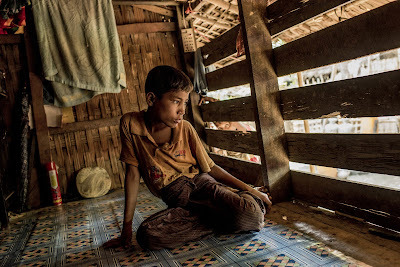 Some were detained in prisonlike way stations in southern Thailand, subject to beatings and torture as the smugglers extorted payments from their families. Hundreds died during the journey each year, from starvation, dehydration and, at times, brutality. As the ship lurched southeast, Ms. Izhar began to grasp the perils at hand. The women were generally spared beatings, but men were punched, shoved and slapped if they irritated the crew, she said. Late one afternoon, the ship erupted in shouting and screaming when some of the crew members prepared to sling overboard the inert body of an older man, whose hands and legs had been bound with rope. The crew beat the man into submission and took him below deck. Ms. Izhar did not know what happened to him after that. After about a week at sea, Ms. Izhar’s family reached a much larger ship, where they joined hundreds of other migrants. The crew included people from Thailand, as well as some other Rohingya, and they spoke as if the ship was somewhere off Thailand. She and the children were ordered down to a stinking, crowded hold three levels below the top deck. Soon after the passengers boarded, the smugglers demanded that they hand over the phone numbers of family members and relatives who were expected to pay for the journey. Ms. Izhar pulled her husband’s number from her tattered bundle of belongings, and in the morning crew members led her away to call him. One of the crew told her husband that his wife was in Thailand. That was the first he knew that she had left Myanmar. Ms. Izhar got on the phone and told him the smugglers were demanding about $2,100 in return for releasing her and the three children. “I don’t have the money to pay for you!” he shouted angrily, and demanded to know why she had left Jubair behind. It is not uncommon for Rohingya women joining their husbands abroad to do so without telling them. If a woman told her husband, “most of the time the husband would not allow her to leave,” said Chris Lewa, a Rohingya rights advocate based in Bangkok. The men fear that if their families join them, they will be saddled with more expenses for a larger apartment or an extra room. Nor is it uncommon for migrants to be separated from their spouses or children for long periods. Ms. Izhar and her children stayed in the hold for weeks while their fate was negotiated. Twice a day, they received water and food: usually a scoop of rice with lentils or dried fish so putrid that she could barely swallow it, although the famished children wolfed down their servings. The smugglers kept up the pressure. One whipped Ms. Izhar several times on the back and waist with a piece of heavy plastic tubing, and they called her husband repeatedly. Haggling ensued. The smugglers’ price dropped to $1,700. Over three weeks after the bargaining began, the money arrived, most of it from an uncle. Three days later, Ms. Izhar and her three children boarded a motorboat with dozens of other migrants, and soon anchored off a beach in northern Malaysia. 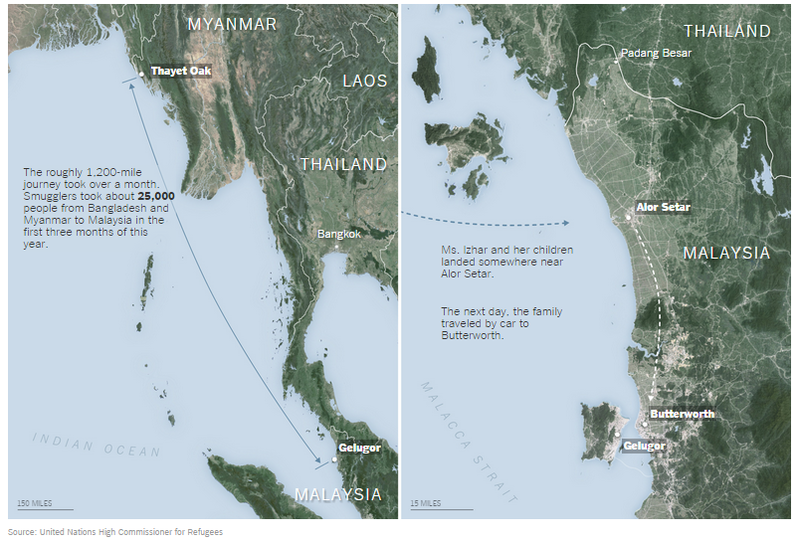 Most Rohingya enter Malaysia after trekking through the jungle of southern Thailand. But Ms. Izhar ended her voyage much as she had started it: trudging through the muddy edge of the sea as she waded ashore. From the nearest city, Sittwe, the capital of Rakhine State, the village of Thayet Oak is a 45-minute ferry ride, then a four-hour drive along rutted dirt roads. Everyone in Thayet Oak seems to know Jubair, the boy who was left behind. In a dark room of his cousin’s bamboo house, where he sometimes sleeps, he sat on the dirt floor and patiently answered questions. Why did your mother leave without you? Are you happy doing this work? Do you want to go to school? School is unlikely. The village, a collection of hamlets with about 5,700 inhabitants, has no secondary school. For most children here, an education means a few years of religious school learning to recite the Quran and the Arabic alphabet, though not enough to read. Six months after his mother left, he remained baffled as to why she did not take him along. Thayet Oak means mango orchard in Burmese, but the reality is less idyllic. 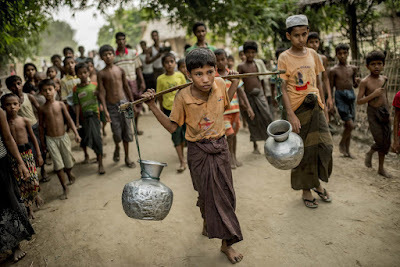 Rohingya are denied citizenship by the Myanmar government, and the residents of Thayet Oak must seek permission before leaving the village, even to collect firewood in the nearby jungle. At a guard post outside the village, police officers watch everyone who comes in and out. Hundreds of young men have left. Villagers are inured to departures and the reality that those who leave almost never return. In early May, a shrimp farmer, Salim Ullah, noticed Jubair sitting in a bamboo shack that serves as the local grocery store. Jubair’s bed had been the sandy, orange-brown dirt road. Mr. Ullah said he had taken Jubair into his home as a servant, giving him work fetching water for the equivalent of $9 a month. Jubair brought along his only belongings: three tattered shirts and two sarongs. “He can stay for as long as he wants,” Mr. Ullah said. The bamboo and thatch house is packed with Mr. Ullah’s family, including his five children, his sister and her two children. Jubair fetches water a dozen times in the morning and again in the evening. He walks barefoot — he does not own shoes — several hundred yards down a dirt path that leads to a well, fills two dented metal jugs and walks back, balancing them on either end of a bamboo pole. When he is not working, he tries to be a normal child. He plays with friends, a mischievous smile occasionally crossing his face. He is a bright boy who quickly grasped the questions of visitors. But he cannot read or write and stared blankly when asked what job he aspired to have. “I want an education,” he said. He has spoken to his mother six or seven times since her departure. She calls a neighbor’s phone, and the neighbors summon him. What did your mother say to you the last time you spoke? Do you miss your mother? He could not speak, and started to cry. Two days after she landed in Malaysia, more than a month after her journey began, Ms. Izhar was driven to Penang Island, where her husband was working on a building site. Mr. Rahman beamed as he held Parmin for the first time. But there were also pained questions as he looked at his emaciated family. At least 75,000 Rohingya live in Malaysia as registered refugees or unregistered migrants, according to the United Nations High Commissioner for Refugees. Rohingya groups say the unregistered number is much higher. Life is safer in Malaysia, and there are more potential jobs than in rural Rakhine State. But under Malaysian law, neither refugees nor unregistered migrants can legally work. They receive no welfare, and most of the men struggle to pick up informal jobs as day laborers. Their children cannot attend government schools, and they must vie for the limited places in crowded, makeshift schools supported by charities and international aid. The crisis at sea has subsided for now. Smugglers are lying low and the monsoon season has deterred escapes by sea. But experts say both the smuggling climate and the weather will change in a few months, and the exodus will resume. 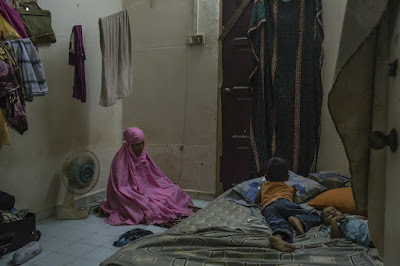 Nearly six months after her voyage, Ms. Izhar and her family share a small, two-story house with 13 other people, mostly Rohingya, in Gelugor, a district of Penang that is a mosaic of middle-class homes and cheap housing, much of it occupied by migrants. She rises at 6:30 to pray; cook breakfast for her family, often rice and an omelet; prepare her son Junaid for a school for refugees; and tidy the cramped, airless bedroom where the couple and three children sleep on a tattered, full-size mattress. Mr. Rahman walks to a spot beside an expressway where he waits for building and maintenance contractors looking for workers. If he is lucky, he can earn $8 to $16 for a day’s work, carrying bricks, cutting grass, or other menial work. But most days he comes home empty-handed. He has fallen three months behind on the rent for the room, about $94 a month, and faces eviction. There is also pressure to repay more than $1,000 he still owes his friends and relatives, the money he borrowed to pay the smugglers. Between household chores, Ms. Izhar waits, consumed by doubt. She waits for word from her husband about whether he has found work. She waits for the family to win official status as refugees, an uncertain process that can take years. She waits for a time, seemingly out of reach, when her family can be reunited. The hours and days blur together. The clock on the bedroom wall has lost its hands, which have fallen to the bottom of the glass case. Finally, Mr. Rahman returns. It was another fruitless day of waiting for work. He slumps on a couch in the garage. A smile flashes across his face when Ms. Izhar brings out the two youngest children. He hugs them and weeps quietly.